We start from Prophet Adam alaihi salam. the first man. When Allah wanted to create Adam, Allah informed the angels of that. The angels asked Allah the reason behind that. Angels did not ask because they intend to disobey. Na’udzubillah. They ask to know and understand. Some scholars said, that previously there were another creation that brought destruction. Allah knows best. And indeed the angels are constantly glorifying Allah and praising Allah. But Allah informed the angels that He knows all things. When Adam’s creation was completed, and Allah has breathed his soul into him, Allah commanded the angels and Iblis (who was residing in heaven) to prostrate to Adam. And as you know, the angels immediately responded to the command except Iblees. It is narrated that Abu Hurayrah said : the Messenger of Allah sallallahu alaihi waslaam said : “Allah created Adam in His image, and he was sixty cubit tall. When He had created Adam, Allah said, “Go and greet them – a group of angels who were sitting – and listen to how they respond, for that will be your greeting and the greeting of descendents, ” so he said, “Assalamu ‘alaikum”, and they said, “Assalamu ‘alaykum warahmatullahh.” So the angles added the word wa rahamatullah. This is among the first thing that the angel taught mankind. When Adam died, who would know how to wash his body. So the angels taught them. In this verse Allah forbids the Jews and the Christians from exaggeration and excess in their religion. the jews – rejected Prophet Eesa alaihi salam altgether. They also exaggerated concerbing the position of Uzayr, their rabbis and monks. Allah refuted the Christians for taking Eesa as the God’s son. He is the Messenger of Allah and the slave of Allah. Believe in Him as a prophet but not to elevate their status as equal to Allah. It was the excessive praises and glorification of Eesa alaihi salam until the deified him and worshiped him as a partner with Allah. This ayah is about the group of people in the time of Prophet Nuh alaihi salam. They are devoted to the worship of their idols and they advised each other to worship them and not to abandon worshiping them. Wadd, Suwa, Yaguth, Ya’uq and Nasr are the names of their idols. The names of these idols are the names of the men who had been righteous in their lives. Their people became excessive in their love for them, so that when they died Satan whispered to them that they should make images in them in order to remember them. Then later, after the generation died, the original purpose of the pictures was forgotten, and the succeeding generations began to worship them. This quran verse prove that exaggeration and excessive veneration of righteous people is an act of shirk. Their excessive praises cause them to cause shirk by worshiping other than Allah. Regarding the righteous people, it is allowed to love them for the sake of Allah, and they should be respected, and followed in their righteousness and their deeds. If they were among the Messengers and Prophets, their laws and that which they were commanded are to be taken from. What they have left behind is to be followed. This is the limit that has been allowed. The exaggeration that is given to the righteous people are giving them special divine characteristics. Like for example claiming that they know the Ghayb and the secrets of the “Preserved Tablet”. We cannot equate Prophet sallallahu alaihi wasalam to the Creator. And this is shirk. Our love to our prophet does not warrant us to make du’a and ask him to grant us things. This du’a must be directed to Allah alone. The Prophet sallalalhu alaihi wasalam forbids his ummah from praising him excessively in order that may never raise him above the status in which Allah has placed him. Believing in him as Allah’s Messenger sallalalhu alaihi wasalam entails believing him in all that he says, obeying him in what he commands, abstaining from what he forbids. But not to the point of elevating him to the status equal to Allah. Prophet sallahu alaihi wasalam prohibits us from excess and exaggeration of praises of Allah’s created beings. 1. Sometimes there is a person that you like for example your favourite speaker. Be aware to over praising him. First as not to destroy the person’s intentions and second to not over exaggerate that destroy you yourself that you overpraise the person to a level that he is not. 2. Be very cautious of being praised as well. 1. the first act of shirk that occurred one earth was concerning the excessive praises of the righteous people. 2. Syaitan’s knowledge of innovation leads to, even if the intention of the doer is good. 3. It is forbidden to exceedingly praise the prophets and other righteous Muslims. 4. The Prophet sallallahu alaihi wasalam took great care to prevent any means that might lead to sin. 5. The Christians exaggerated in the praise of Eesa. 6. The hadith refutes those who claim that Muhammad sallallahu alaihi wasalam was more than a Messenger. This is the kind of terror that you get when you are shock. But Al Qariah would be even more shocking than any of the shock you ever had. This is due to the severity and shocking events of the day. it is an indication that the subject being asked is something serious and also frightening. It is a question that asks what will make you know of the subject concerned. And be sure that Allah will follow up with verses explaining the subject. Allah mentions in Surah al Haqqah that the people of Thamud and ‘Ad rejected Al Qariah meaning they reject n the fact that they will be raised back after their death. These will be among the people who will be shocked to see the truth of the terror of the day when it comes! Allah describes that on the Striking Hour, the mankind will be like moths scattered about. 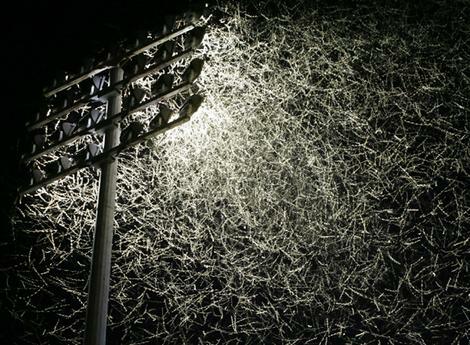 Have you seen the blizzard of moths swarming about a source of light? Have you observed how they fly about? Describe it. Allah intensifies concerning the fright of the day by describing the condition of human on that day that will be scattering, their coming and their going, all due to being bewildered at what is happening to them, just like scattered moths. They will move about, stumbling to one another. 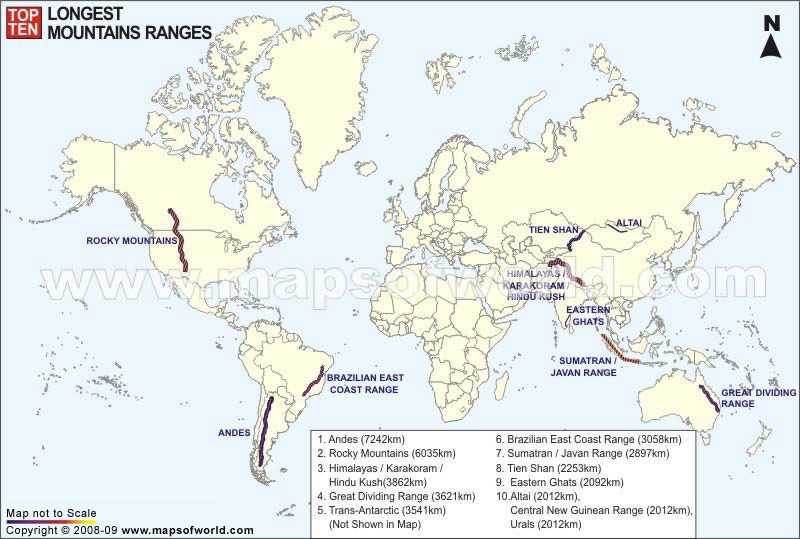 This is a map showing the greatest mountain ranges in the world. Some of them host among the tallest and greatest mountains. Look at a mountain and contemplate. 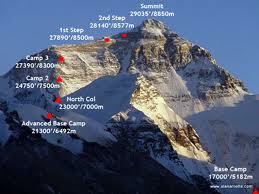 A mountain huge and sturdy. Imagine they will turn to wool that will be blown easily by any soft breeze. They will become nothing. And that is exactly what will happen on the striking hour when human will be running around in panic and things turned chaotic. At the end of that Day, there will be a Balance that will be set up to weigh people’s deeds. Qurtubi said: “When the Reckoning would have been completed, the deeds will be weighed. The weighing will be for the purpose of requital, so it should come after the Reckoning. The Reckoning will be an evaluation of people’s deeds, then the weighing will be to determine their values so that reward or punishment may be awarded accordingly. The scale will be vast! The scale will be precise and will not give any discrepancy in its measurements! If scale of good deeds are heavy – He will live a pleasant life that is in Jannah. If scale of good deeds are light also meaning the bad deeds are heavy – He will be tormented in Hellfire. What do you think is the pleasant life? Zuhr Ibn Habeesh related from Ibn Mas’ud [RA] that he had very thin legs. (One day), the wind flung away (his garments thus exposing them). The people laughed at him. Then Messenger of Allah [SAW] said: What are you laughing at? They said: O Prophet[SAW], from the thinness of his legs. He[SAW] said: By the One who has my soul in His Hand, the two of them (ie his two legs) are indeed heavier in the Balance than Uhud (a large mountain in Madinah). Musa (Moses) (May the peace and blessing of Allah be upon him)said: ‘O my Rabb, teach me something through which I can remember You and supplicate to You.’ Allah answered: ‘Say, O Musa, La ilaha ilIa-Allah’. Musa said: ‘O my Rabb, all your slaves say these words’. Allah said: ‘O Musa, if the seven heavens and all they contain other than Me (Ghairy) and the seven earths as well, were all put in one side of a scale and La ilaha ilIa-Allah put in the other the latter would overweigh them. '” [This Hadith has been reported by Ibn Hibban, and Al-Hakim declared it Sahih]. If you translate this verse with little Arabic that we know it would mean “So his mother will be Hawiyyah.” Remember the word for “mother” is أم. Some scholars translate mother to mean, that one will fall into Hawiyyah head first as the head the mother of the body. Some other interpret the meaning as, on a distressing day one will be running to what should comfort him most. Like a child running to his mother. But the only thing that the sinners will be running to is hell. Thus their mother on that day is the blazing hell. Hawwiyah is another name that Allah uses for Hell. Do you remember that we learn the word that Allah uses for hell in Surah humazah? Hawwiyyah is described as chasm or abyss or bottomless pit because the one who is being thrown into it is thrown from top to bottom. It is a hot blazing fire. Which means the heat is extreme. May Allah protect us from it! 2. Horrifying things will happen on yawm al akhirah : the huge sturdy mountains will be just like discarded wool totally destroyed. 4. The one with the heavy balance – will live a life of pleasure that is Paradise. 5. The one light in balance – will be thrown into hell fire with blazing fire. Pure in this connotation denotes that Allah is Holy – Al Qudoos, free from all deficiencies and flaws. Allah use the word tayyib in a few different context in the quran. Speech that is good and pure while the wicked is impure. Please refer to the arabic. Allah uses the word Tayyib to describe good. Allah also describes the Believers as pure. The word Tayyib here is used as pure or pious. Because of the faith in the believer’s heart, he is completely pure: his heart, his tongue, and his body. These are the fruits of faith. Can you name the deeds that are pure done by the following organ? The greatest ways in which a believer can achieve purity of deeds is by purity of his food, making sure it is from lawful sources. In both these verses (in the hadith) are Allah’s commands for us to eat things that are Tayyib – lawful. Tayyib here means lawful. Lawful (in the context of food) means it is halal. In general one can eat anything unless it is stipulated as haram. And that is why it seems like in religion only haram things are discussed because there are plentiful of halal things to eat out there. animals that we are not allowed to eat which hunt its prey using teeth and claws like dogs, cats and tigers. Animals that are killed not by slaughtering – strangled, beaten, electrocuted and so forth. Forbidden to You (for food) are: Al-Maytatah (the dead animals – cattle-beast not slaughtered), blood, the flesh of swine, and the meat of that which has been slaughtered as a sacrifice for others than Allâh, or has been slaughtered for idols, etc., or on which Allâh’s Name has not been mentioned while slaughtering, and that which has been killed by strangling, or by a violent blow, or by a headlong fall, or by the goring of horns – and that which has been (partly) eaten by a wild animal – unless You are Able to slaughter it (before its death) ­ and that which is sacrificed (slaughtered) on An­Nusub (stone altars). (Forbidden) also is to use arrows seeking luck or decision, (all) that is Fisqun (disobedience of Allâh and sin). This day, those who disbelieved have given up All hope of Your religion, so fear them not, but fear Me. This day, I have perfected Your Religion for you, completed My Favour upon you, and have chosen for You Islâm as Your religion. but as for Him who is forced by Severe hunger, with no inclination to sin (such can eat These above-mentioned meats), Then surely, Allâh is Oft­Forgiving, Most Merciful. 7. 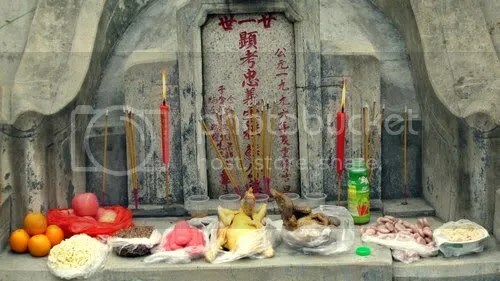 Even halal food can become haram like fruits presented to idols such as the mandarin oranges put at the altar or the graves. Intoxication and drugs (except for lawful use of medicine) is the mother of evils. This is a good read, Insya Allah. HERE. This indicates that eating what is lawful helps one to do righteous deeds. The Prophets, peace be upon them, did this in the most perfect manner, and did all kinds of good deeds in words, actions, guidance and advice. May Allah reward them with good on behalf of the people. For as long as the food is lawful and the work is righteous, then the deeds be accepted. What is also haram food include the food that is bought using illegal money. Illegal money may come from stealing, or haram job, money out of lying, gambling money and so forth. Haram money brought to the home will be used to feed the family, he clothes they wear, the education they paid for, the medicine they bought and so forth. The whole life is built from haram. If then, how can the supplications be accepted? The Pious Predecessors used to fear for themselves from the implication of this verse that their deeds are not accepted by Allah. They pray for many months that their deeds in ramadhan is accepted. Whereas we are confident with our little worship. Astaghfirulah! Charity out of ill gotten money is not acceptable. Eating what is unlawful corrupts one deeds and prevents them from being accepted. Allah commands His servants and Messengers, peace be upon them all, to eat lawful food and do righteous deeds. The Prophet sallallahu alaihi wasalam described the man who has travelled for a long period until he became unkempt and exhausted to illustrate a condition of hardship and humility during which response to supplication is most expected. Narrated by Abu Hurayrah that the Prophet salllahualaihi wasalam said, “There are three whose supplication is answered without doubt: The supplication of the oppressed, the supplication of the traveler, and the supplication for the father od his son.” (Abu dawood in Kitab as Salah). Bearing difficulties and dejection are some of the greatest causes for answer to supplication. 2. One’s clothes have become worn out, and his appearance is disheveled and dusty. 4. Pleading with Allah by repetitively remembering and metioning His Lordship. Using the supplication that are found in Quran, they areusually mentioned with the name of the Lord. Other time that du’a is most maqbul. Tick what you can do most often. 13. Dua after praising Allah and giving salat on the Prophet (SAW) in the tashahhud at the end of salat. 14. The dua of a Muslim for his absent brother or sister Muslim stemming from the heart. 18. When Muslims gather for the purpose of invoking and remembering Allah (Dhikrullah). 22. Dua of the one fasting until he breaks his fast. 31. Dua at any of the holy sites. Prophet sallallahu alaihi wasalam indicated what prevents the supplication from being answered which are delving into the unlawful whether from food, drink, clothes or nutrition. If we study the description of the man, we can perhaps infer that the man may be on his journey for hajj and jihad – the greatest deed in the sight of Allah. Yet, in spite of that, there remains a preventative factor when the person calls Allah: his unworthiness due to prolonged consumption of haram. However, Allah does answer the supplication of the disobedient person. In fact He did answer the supplication one of the greatest disbeliever. Do you know who it is? What did he supplicate for? Allah also answers the supplication of the disbelievers even though they are not asking from Him. However, what Allah gives to them in this world now is insignificant compared to what Allah will give to the believers in yaumul akhirah. He answers the supplication due to His great wisdom and his infinite Grace and Kindness and Generosity. Allaah knows best. This hadith, should make us alert that if one persists on consuming what is haram, they should not expect Allah’s aid and that response to his supplication is most likely until he repents from the sin. Allah is pure and except only what is pure. He only accepts the pure ones to enter in Jannah. The pure ones are the one who does good deeds (Amal soleh) and among the righteous (soleh). The word صلح is usually translated as righteous. It actually carries the meaning of rectification, and being worthy or suitable, etc. O You Who is Everliving and Sustains and Protects everything, I seek assistance through the means of your mercy, rectify for me all my affairs and do not leave me to myself, even for the blink of an eye. The word aslih أصلح is translated as Rectify. وَعَمِلُواْ ٱلصَّـٰلِحَـٰتِ – amilus solihat is translated as good deeds. Why Allah calls it solihat – because the deeds make them proper and good. The deeds are to correct and rectify the person. It makes them good and rectify the worldly affair and akhirat. What it also means is doing deed that will rectify you so that you become among the solihin (صاليحين). The soleh people (solihin is the plural for soleh) are the people who did deeds that rectified them and they become those who are rectified or those who are worthy because they are rectified. Becomes worthy for what? Rectified and only then will be يصلح suitable/ worthy/ fit to be among Ar Rahman in His Jannah. Jannah is only for the one who is rectified and had taqwa and did deeds that rectified them and made them worthy. Allah only accepts those who are pure and they are from people who do righteous deeds. In this hadith the importance of avoiding the unlawful is emphasized. And this is one of those ahaadeeth upon which the Principles and Rulings of Islaam are built. It teaches that whoever expects his deeds to be accepted by Allah must not pollute them with something unlawful. A person who would like his supplications be answered by Allah should take care to consume only what is lawful. And that whosoever wishes to supplicate to Allaah should humble and submit himself before his Lord with that which is Halaal.